…room number 20. The ringing stopped as soon as we entered. “What is the matter now?” I asked them. They walked carefully around the edges of the room. I watched with an amusement shared, I think, by the wise old tortoise. ● The obvious (if you have completed the rest of the circuit) correct door is 1 . ● The tower in the poster on the right being struck by lightning is very reminiscent of the tower card in a tarot deck. [Independent Credit: Beelzebibble | White Raven] The number of the tower card is 16. The tower in poster has an open top and open door, the tower in the chair opposite the poster has a closed top and closed door. This room is the 16th room of the 16 step path to the center and back. 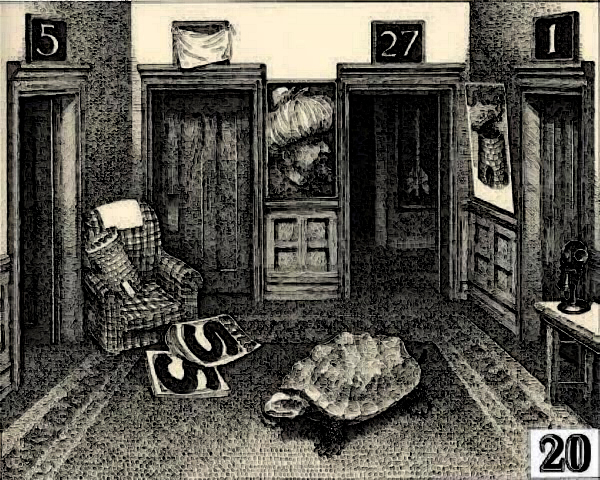 If you are in this room at the end of the 16 steps, you go to door 1 indicated by the 16th tarot card and the open tower. If however you are not on the 16th step then go back to the path by going through door 5, indicated by the closed tower. [Credit: One For Me | White Raven] Also the closed tower is resting in a chair, suggesting perhaps that this is the “not leaving” choice. [Credit: V-Watt’s Electric Labyrinth Love Luau] The man with the turban may reinforce the tarot connection reminiscent of the traditional garb of tarot card readers for much of this last century. What is the connection between the phone which is facing up and that pheon which is facing down? The phrase “backwards looks” also hints to the fact that if you’ve entered this room from room one when starting out, that you are going backwards and need to turn around. “The ringing stopped as soon as we entered.” – Would this be in reference to a phonetic pause from the letters “ p “ and “ b “ ? Because I know that if you were to add the letter “ b “ to the beginning of the word “ ringing “ , it would then spell out “ bringing “ , which also means “ stop “ . It seems to be a “ phonetic connection “ , of sorts. @Aria The plastron (plaster on) is the flat ventral surface part of the turtles’ shell. It also includes within its structure, the anterior and posterior bridge struts and the bridge of the shell. The plastron is made up of nine bones and the two epiplastra at the anterior border of the plastron are homologous to the clavicles of other tetrapods. Are you asking why Manson drew a shell on the turtle? I’m sure there are other related instances of the letter ” T ” that I have yet to come across. Also the letter ” T ” itself, could be another clew. Looks as if it might be a hammer, could be a compass of sorts, might even be a stone chisel that’s used for the extraction of beryll. The only thing I’m having a hard time figuring out is the 33 part carapace of the tortoise (9 on top/24 ridges) , the letter ” S ” on the head of the tortoise, and the plaster on the tortoise, itself. Don’t forget Tartan, Table, and Turtle! The idea above is that the Ts are there to go with the arrow and make “tarot.” Which tells you to interpret the tower image as the Tower card in the tarot, which is card 16 of the major arcana, indicating the end of the 16-step path? T = 20, and this is Room 20, which is (I guess?) why others have seen the Ts as a red herring. @Aria Thank you for your advice. What about the plaster on the turtle? I don’t know what you mean by the plaster on the turtle. I think those door panels and that metal-looking panel on the doors are all unique to this room. They are all one-shaped. There has to be some kind of chess thing going on in here. Specifically, I think we are getting the message CHECKMATE, which is a signal that this room comes at the end of the game (note “amusement” in text, a synonym for game), just as checkmate signals the end of a game of chess. 1. There are two rooks, one in each corner of the room, echoing their initial position on a chessboard. 2. The pattern on the panelling evokes the pattern on a chessboard. 3. There is a CHECKed pattern on the chair. 5. Perhaps we put the CHair with CHecks with the SS on the floor to suggest chess? Yeaahhhhh I know. 6. The three examples of white cloths in the room could signify surrender, which is what happens at the end of a chess game — you never actually take the king once he’s checkmated, right? The implication being he has surrendered? Maybe? Yeaahhhhh I know. The ringing telephone stopping is an indication that your journey has come full circle. 1, 26, and 20 are the only rooms that acknowledge the ringing, but the “bell” explanation in 26 (the start of your journey) is just a red herring. This also opens up the possibility that the group has been hearing the telephone ringing in the background the ENTIRE TIME! Briiiiinnnnngggg!!! Briiiiiiiinnnnggggg!!! Briiiiinnnnnngggg!!! Briiiiiiiiinnnnnggggg!!! Briiiiinnnngggg!!! Briiiiiiiiinnnnggggg!!! Briiiiinnnngggg!!! Briiiiiiiiinnnnnngggg!!! Briiiiinnnnggggg!!! Briiiiiiiiinnnngggg!!! Briiiiinnnnggggg!!! Congratulations also to Beelzebibble and V-Watt’s Electric Labyrinth Love Luau for other parts of this riddle. Another thing that clues the idea of taking that door only on your way back but not taking it when you’re still trying to get to 45: it’s a door to room 1. Ha! Yes, I figure the point of this is mostly about door 5 and the clue to door 1 is a counterpoint. There are a couple of things that confuse me about this solution. 1. Why does open door = end of journey and closed door = beginning of journey? “Open” or “opening” means “beginning” and “close” means “end,” so this seems counterintuitive to me. 2. There are several ways you could approach this room, two of which are mentioned in the solution. To start with those two: Either you get here at the end of the journey, as you’re supposed to, or you pick door 20 as your first step from room 1. To me, in both of those cases, the best door to take is clearly 1. For the first case it’s obvious why. In the second case, if you just go on to 5, even if you find your way to 45 and out again, you have not found the 16-step path and you will miss the “ATLAS” clue in Room 26. Surely the best thing to do is go out to 1 and start again? Another possibility is that you got to 30, went to room 5, and then got to room 20 from there. I guess in that case it might make more sense to go back to 30 via 5 from 20, and get right back on the 16-step Path, but how can this possibility be distinguished from the first two I mentioned? To me, skipping a room on the Path means you haven’t done everything you needed to do based on the Directions (“find the shortest possible path”). If you stray from the 16-step Path, you need to be able to get back to the room where you screwed up and then keep going — if you don’t, you haven’t found the Path. Obviously this isn’t possible if you’ve strayed into the Trap, and if you’ve gotten dumped in the Loop you can only do this by first getting back to 41 and starting again. It’s when the inter-Path connections come into play that things get more complicated. While I agree with you on all your points, one might be more existential about the matter of entering rooms 5, 2, 32, and any other ‘off path rooms’. As the Guide points out, every room in the Maze might teach us something, despite its location, about itself, somewhere else in the Maze, or perhaps the Guide. 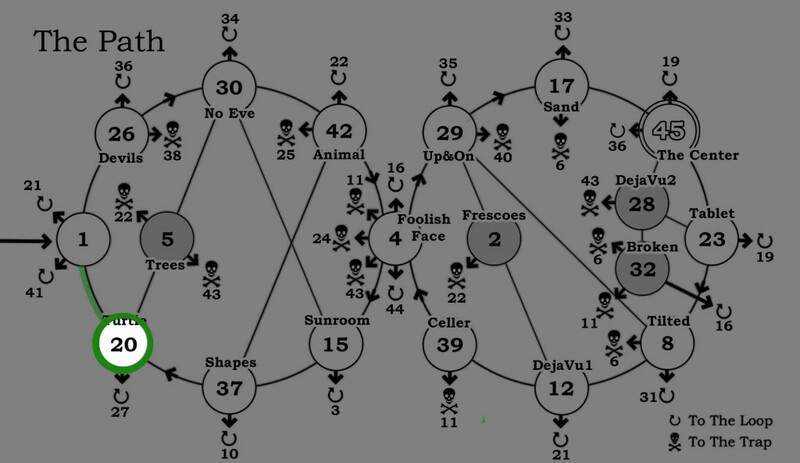 As well, if a reader were to map out the 18-step map (traversing 1-20-5-30-etc.) they will indeed miss the message of the path, HOWEVER if they have got this far, which is entirely possible since mapping is ‘absolute’ (as opposed to clues, which subjectively, no one can seem to agree on), then I think they can then backtrack and trim off the rooms they discover are not necessary (thus amending their map to 1-26-30-etc.). In this respect, I believe Manson has added an extra level to the difficulty of the Puzzle by not only creating loops and traps, but also variations of the path that cause frustration when trying to complete an objective such as finding the shortest path. I might also add on an unrelated tip that I don’t see the Omega pattern in the carpet mentioned on the solution list (Omega = last greek letter, last room on the path). I know vewatkins “couldn’t see it” but let’s not let his hang ups affect TIER ONE CLUES! The tower image on the right is as it is depicted in the card. The tower card = 16. This door is the 16th step. Open is escape from the tower – Victory! The tower in the chair is not destroyed. This is the anti-tower symbol. Not 16. Closed is not leaving yet – still a prisoner of the tower. The solution works without the open and closed aspects but I think they are intentional inclusions since making the anti-tower could have been done in any number of other ways. I agree with you about starting at Room 1 but you are forgetting that we already know that this room is the last step of the 16 steps because we have mapped the rooms and know the correct path. What if we did not? This puzzle confirms that this room (not some other room) is the last step of the 16 step path. Does this help or am I just in deeper? The omega symbol solution is not in the solution summary. I added enhanced images of the carpet-symbol to the Related Images page so that it could be discussed with more clarity but I did not mean to suggest that I agreed with it. Thanks WR. I agree that the main point of any solution in this room would be to confirm that this is the end of the road. I guess my question, though, is why would we go to Room 5 if we came here first from Room 1? Shouldn’t we go straight back out to Room 1 and try again for the correct first move on the 16-step path? Or are you saying that the closed tower isn’t actually directing us to go to Room 5 but is just telling us something about Room 5? This way if you are done. That way if you are not done. Either way you have a clue that this is the last room. If both clues pointed to door 1 the puzzle wouldn’t work in delivering this message. The fact that Room 5 isn’t the best choice if you have failed to reach the center is beside the point since unless you have already visited Room 45 you have already failed. But if it helps, the puzzle works just the same if you think of the closed anti-tower as false clue meant to lead us astray on our second attempt at finding the center. I’m reusing Aria’s anti-hermit language from Room 27. It is simply a way of saying that the closed tower in the chair is a modification of the tower card picture on the wall. Obviously getting the 16-step path was the big puzzle for the $, but it also makes a certain amount of sense that this room would be directing to 5 “if you are not done,” as WR said. You can still get to 45 from here, and there is value in cluing that – it just won’t be the 16-step path. Great, now I have Neil Diamond in my head. I noticed that there are a suspicious amount of perfectly round rings in this room, perhaps reinforcing the Omega carpet and concept that this is the last room in the set. See attached image: imgur.com/ 2yTbTJx – I actually forgot to include the tortoise’s eye, which is the same shape. I guess the 5 rings in the room are in reference to Room 5, which would be the slow (tortoise) way to get to 30 rather than the faster hare’s route. Aria aptly pointed out that one would miss the “Atlas” clue in 26, but the MAZE instructions tell us to look on the shortest path. It wouldn’t take much, after the shortest route completed, that 1-20-5-30 is found, and keeps you on the path intact, albeit longer. The two castles are rooks from a chess game. This is reinforced by the checks on the chair and the eight squares in the panelling (8 squares in a row on a chess board). Also, maybe, CHair, CHecks, + SS. On any given turn, a rook can only move in a straight line in one direction. A move represented by the straight line of the number 1. Just for punny fun… “the ringing stopped.” The past tense of “ring” is “rung.” And look at the telephone table… its legs have two supports that look a lot like ladder rungs. All right, OK, it’s not the past tense, it’s part of the past participle/past perfect. Whatever. OK, so here’s what I don’t understand. If the “H” clues in 15 indicate the “hare” then why don’t the “T” clues in 20 indicate the tortoise? Why are they a red herring? Couldn’t they just be there for symmetry with the “H” clues to strengthen the “tortoise and hare” connection between the rooms? I mean, even though the “H” tells you it’s a hare, not a rabbit, and the “T” doesn’t help you distinguish a turtle from a tortoise because they are both T words. Or is that WHY it’s a red herring? Just a thought, how about castle/tower? There is a pic of it with the roof coming off being struck by lightening on the wall, and a model sitting on the *incredibly* comfy looking chair (I’m a bit tired. The floor of room 24 is looking good as long as I can sleep on it. Now thang I think about it, it’s nice and dark, and all those eye things could sing me a lullaby… ;)…) The model is leaning towards room 5 (wrong) but the lightening picture could be saying that room 5 is bad, since the thing pointing to it is getting struck by lightening.